Click to download a copy of the flyer. 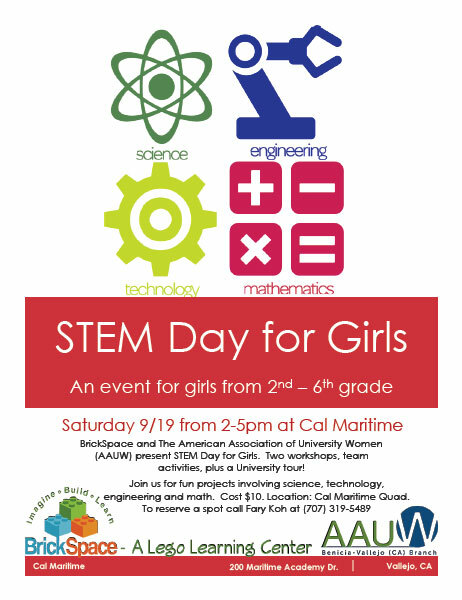 BrickSpace and The American Association of University Women (AAUW) present STEM Day for Girls. Two workshops, team activities, plus a University tour! Join us for fun projects involving science, technology, engineering and math. To reserve a spot call Fary Koh at 707.319.5489. This entry was posted in Branch Events on September 10, 2015 by sr-support1.